Eldrad Must Die! 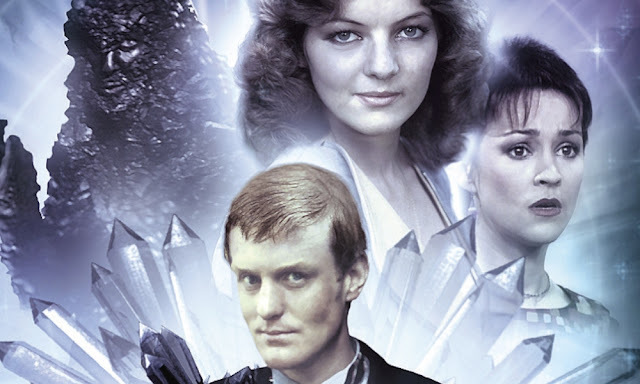 Is the first story in another trilogy that sees the continued adventures of the Fifth Doctor and his companions Tegan, Nyssa and Turlough. Because of this cast, it should have been brilliant, not only because of their acting but also because of the return of a classic villain from the story The Hand of Fear. But it isn't. It just isn't brilliant. Having said that, the first episode of this story is great, with very little focus being put on Eldrad or the other members of his species and instead focuses on our favourite time travelling team. It is a joy to hear The Doctor and Tegan paddling and Nyssa and Turlough exploring rock pools. It has some great moments and this episode plays to the strengths of the regulars making it a quick listen. I particularly like the part in the pub when Nyssa wins at the fruit machine. However, from the end of episode one, the whole thing quickly goes downhill. I'm not sure where it begins its decent but by the end of the second episode you are left debating whether to continue. I think that far too much attention is paid to the Kastrians and Eldrad rather than keeping the focus on the regulars and the scenes with Eldrad or the Kastrians, more often than not are boring. It becomes apparent very quickly that Mark Strickson playing companion Turlough has been given a lot to do and while he rises to the challenge wonderfully, Turlough isn't necessarily the companion that I would have chosen to be the spokesperson for the Kastrians. I know that Tegan was infected with the Mara and, while it seemed to be expelled during The Cradle of the Snake, you never can know if it's influence is one hundred percent gone forever and Nyssa throughout the books and number of audios is unfairly given the task of being taken over. So, maybe it is Turlough's turn but I don't feel the companion is interesting enough to carry this of. This is no reflection on Mark Strickson who does an excellent job with what he has been given, I just don't like that he is sometimes sidelined in stories and suddenly brought to the forefront like this with very little exposition given as to why. While episode one is brilliant and episode two is tolerable, episodes 3 and 4 are exceedingly dull. I lost where I was not to far after the Doctor, Nyssa and Kate get of the dingy. Most of these episodes feel like we've been listening in on conversations and only hearing bits and pieces and most of it seems like padding until we reach the conclusion. Author Marc Platt does a good enough job to bring back an old monster but somewhere along the way the story gets confused, companions virtually forgotten about and the story slides into oblivion. ELDRAD MUST DIE!, WRITTEN BY MARC PLATT AND STARRING PETER DAVISON, JANET FIELDING, SARAH SUTTON AND MARK STRICKSON WAS RELEASED BY BIG FINISH IN APRIL 2013.